You will receive a personal welcome when you arrive at the Boathouse. Your knowledgeable, friendly host will assist you with all your enquiries. Coffee, tea, sugar and milk as well as bathroom accessories are available for your convenience upon arrival. 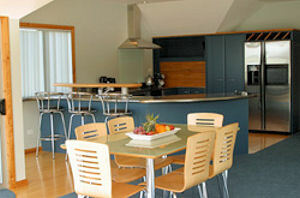 Large, superbly appointed kitchen with top-of-the range appliances. Spacious living and dining areas with sweeping views. Individually controlled air conditioning for summer and winter comfort. Bedrooms with large built-in wardrobe, dressing table and king size beds. Beautifully tiled bathroom with under-floor heating and heated towel rail. Hair dryer, bath robes. Laundry with tub, washer, dryer, iron and ironing board. Monitored security alarm and fire alarm. Personal safe. The decks are furnished with kwila outdoor furniture. Lounge chairs, and a gas barbecue. Fax machine and free wireless broadband internet access.